If I thought the label vegan was stigmatizing, never mind what people think when you tell them you are eating raw food! I have had friends flat out refuse to go to a raw restaurant with me (where’s the meat? where’s the heat? they exclaimed). Eating raw foods could be as simple a summer salad, or snacking on some fresh fruit, which are not too horrific in the slightest. For those eating only raw foods (not me, don’t worry), this would quickly become boring! This is when it becomes exciting, because the experimentation in raw foods has created some luscious treats, perfect during the hot summer when you don’t want to turn on your stove or oven. Summer berries are at their prime right now and I know the virtues of eating berries, plain, unadorned, in all their glory. Let me fill you in on a secret: there is food synergy at play. 1+1 does not equal 2. Combine your favourite summer berries and top with a nutty topping for a delicious crisp. No oven required. If it were that simple, it wouldn’t as phenomenal. This is the second secret: macerate your berries. Blend your berries. Use a portion of your berries to create a sweet juice, just as if you baked your crumble and it is oozing those lovely fruit juices. I cringed when I mashed my blackberries (my beautiful blackberries! ), but it is what brings this dessert to the next level. It isn’t just berries and nuts. This is being submitted to this week’s Weekend Wellness, this week’s Weekend Herb Blogging, hosted by Anh from A Food Lover’s Journey. 1. Pulse almonds, coconut, cinnamon, raisins, dates, sugar and salt in a food processor until coarse. Do not over-process. 2. Take 2 cups of berries and mash with a fork. Combine with remainder of berries and nutmeg. Add sugar to taste. 3. Divide berries between 4 ramekins and top with almond mixture. I love raw foods too – I find that it helps encourage really creative new recipes (takes on old favorites, or what have you) that taste SO fresh and delicious. My parents stigmatize me based on the “pescatarian” (though mostly veg) label, so I can only imagine what they would say if I mentioned raw foods to them! I do love veggies and fruit in their unadulterated state though, and this sounds delicious! Raw foods are fantastic. I love that you used coconut in this too. 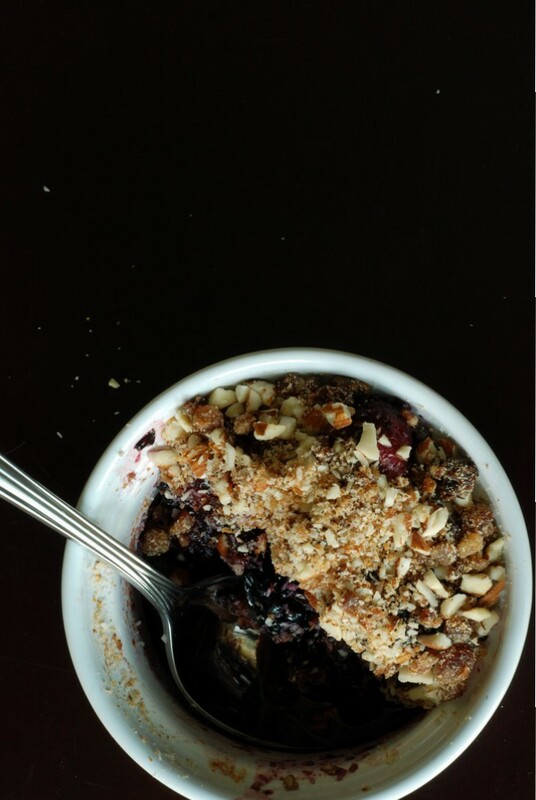 My filling would be cherries and blackberries – I can’t get enough right now! Ooooh, I love this recipe! Breakfast for sure! 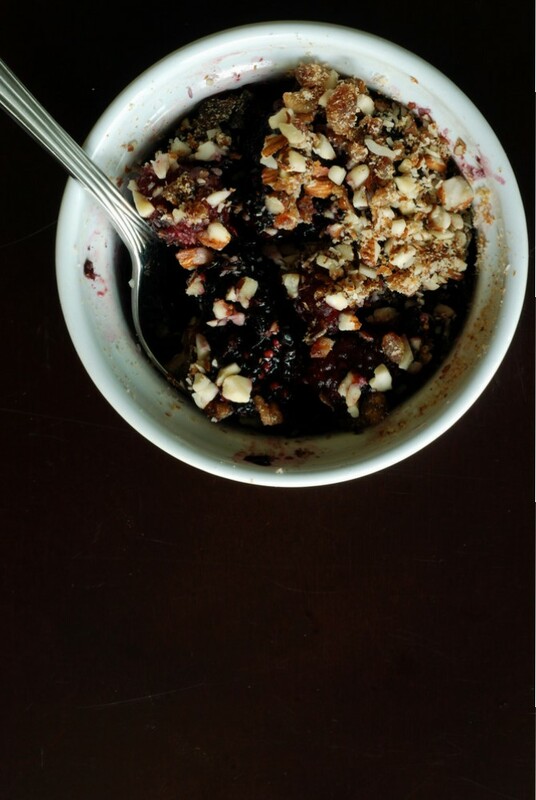 And, yes, having fun experimenting with raw foods does result in some pretty amazing healthy treats. Can’t wait for the berries to appear at the farmer’s market!